We’ve heard a lot about Country Style over the years, (no not the donut chain, the Hungarian restaurant) so we finally decided to check it out last weekend. We weren’t expecting to be wowed since it was on the list of comfort food spots for many people. I’m writing about it anyway not because it’s trendy or a particularly excellent dining establishment, but because like many mom and pop shops that cater to niche markets or stay low-cost and under the radar, places like this have staying power and are an integral part of their community. 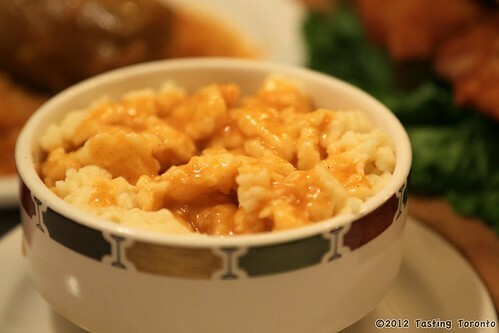 Though my first instinct was to try the Chicken Paprikash with Perogies for an app and perhaps some Goulash on the side, we had limited stomach room and opted for their signature Country Style Wooden Plate for two. 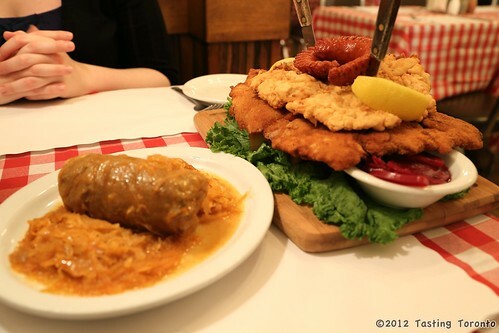 The plate was a combination of a Cabbage Roll, Wiener Schnitzel, Parisian Schnitzel, Fried Sausage, Beets, Rice, and Home Fries. The schnitzels were thinly pounded and incredibly large. We liked the Wiener (sounds like a sausage, but it's not) Schnitzel's breaded crust better than the Parisian's egg coating. We loved the firm and well seasoned fried sausage. The cabbage roll was a complete meal unto itself, not just because it was a huge, but also because you pretty much have your carbs in the form of rice, as well as meat and vegetable in it all together. We also had a side of dumplings, which in this context are plain doughy little things and not the stuffed Asian kind. That was certainly more than enough food for the two of us, and we ended up taking the rest home. Because I'm Filipino, I had the leftover schnitzels with steamed rice and a little ketchup, like a Filipino-Spanish torta. It is comfort food after all. I've never been to a Hungarian restaurant before, so...Wow! - that wooden "plate for two" looks huge! Are those the dumplings in the little bowl? It almost looks like a crazy rice pudding or something!